The graph below illustrates the size of orchestra required to perform symphonies composed between 1750 and 1920. Each symphony is represented by two dots: the red dots and line represent woodwind instruments; blue relates to brass instruments. The standard notation for orchestra sizes, on which this graph is based, consists of two groups of four numbers, such as 2,2,2,2 – 4,2,2,1. The first group lists the number of woodwind players (flutes, oboes, clarinets and bassoons respectively) and the second is the number of brass players (horns, trumpets, trombones and tubas). Related instruments, such as piccolos and bass trombones, may be indicated in various ways alongside their counterparts, so a ‘+1’ after the first number would indicate that there is one piccolo player in addition to the flautists. The number of strings, often the largest part of the orchestra, is rarely specified – this seems to be largely a matter of judgement for the leader or conductor based on how many other instruments there are. Percussion, keyboards, harp and other sections of the orchestra are usually specified separately after the numerical notation. So the woodwind and brass typically represent rather less than half of the entire orchestra, although their numbers will tend to be correlated with the total number of players. The graph shows that the number of players increased, on average, from just two winds and two brass players in the mid eighteenth century, up to more than ten of each by the end of the nineteenth. No eighteenth-century composers asked for more than eight winds or six brass players, but by the early twentieth century it was not unheard of to require more than twenty of each. There are many reasons for this growth – including changing tastes; the development of new and better instruments; a rise in the popularity of public concerts and the consequent growth in the size of concert halls; or increasing sophistication, ambition and competitiveness among composers. The red and blue lines are derived as smoothed and localised averages of the values around each composition year. The average number of woodwinds rises first, presumably with the invention and increasing popularity of the clarinet in the second half of the eighteenth century. The number of brass instruments catches up during the first half of the nineteenth century, reflecting improvements in keys and valves, better manufacturing techniques, and the invention of a host of new instruments. Looking at the data more closely, the range of instruments in each category also grows over the period. In the eighteenth century there were few variants of the main four instruments in each category, but by the twentieth there was a range of treble and bass forms of the standard instruments (such as piccolos, bass trombones, and contrabassoons), versions tuned to different keys, and even whole new families (such as saxophones). There was clearly a steady increase in the average size of symphony orchestras, but it is also clear that symphonies have always been written for a wide range of orchestra sizes. As is usually the case in statistical analysis, the average is only a small part of the story, and the spread of values is at least as interesting. Why, for example, did composers appear increasingly to ask for very large orchestras (compared to the average) during the second quarter of the nineteenth century, and again after about 1880, with an apparent gap in this trend during the third quarter? Why did quite small orchestras apparently become increasingly common towards the end of the nineteenth century? The ‘apparently’ in this question is important because we must consider the number of very large or small orchestras against the overall number of symphonies written around this time. 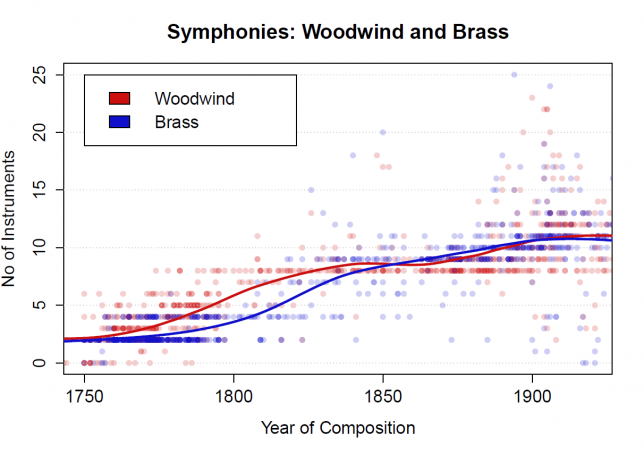 Since the total number of symphonies was much higher at the end of the nineteenth century than it was fifty years earlier, the number of those for very large or small orchestras will be higher in the later period, even if the underlying proportion was the same. Although the density of transparent red or blue dots on this graph gives some indication of the weight of numbers, further analysis is required to test whether, for example, the proportion of symphonies for small orchestra (fewer than five winds or brass, say) increased between the 1850s and the 1900s. As with any statistical analysis, it is important to consider the reasons why the data might not be telling us the whole story. We have already seen that the data only accounts for less than half of a typical orchestra – simply because the standard numerical formulae for winds and brass are the only readily available quantitative data. The size of the rest of the orchestra is unknown: for example, there are many symphonies for strings alone (absent from this graph), and a handful written only for winds and/or brass. The variability of orchestra sizes is therefore likely to be larger than is implied by this graph. An additional source of uncertainty comes from the data itself. The graph is based on a dataset of around 7,500 symphonies, scraped from several different sources, and merged together with considerable manual input. Not all of the data is available for every symphony on the list: the numbers of woodwinds and brass data was only available for 780 of the 3,142 symphonies written between 1750 and 1920 – about one in four. This data came mainly from a combination of publishers’ hire catalogues, guides to the orchestral repertoire and general music databases. It is therefore biased towards the better-known works that orchestras today might want to perform. More obscure symphonies might not have been heard or looked at for many years, will not have parts for sale or hire, and few orchestras or concert promoters will be interested in programming them. Information on their instrumentation is therefore more likely to be either unknown or of insufficient interest for inclusion in these sources. Recognising these sources of bias is important, but it is not at all obvious whether, or how, they might affect the data on orchestra size. It may or may not be the case that better-known works tend to be for larger or smaller orchestras than more obscure works, or that they are more or less likely to be unusually large or small. One could argue that works requiring unusual numbers or combinations of instruments are less likely to be performed (and thus more likely to sink into obscurity) than those that fit comfortably with the resources of a standard orchestra. Or, on the other hand, they might be more popular because they stand out from the crowd. Further research would be needed to get to the bottom of this. One of the joys and frustrations of statistical research in music history is that this sort of analysis invariably raises lots of new questions. ‘Further research is needed’ will be a common phrase on this website! Cite this article as: Gustar, A.J. 'The Size of Symphony Orchestras' in Statistics in Historical Musicology, 24th October 2017, https://www.musichistorystats.com/the-size-of-symphony-orchestras/.